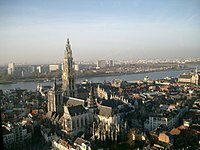 Antwerp Province (Dutch: Provincie Antwerpen [ˈɑntʋɛrpə(n)] ( listen)) is the northernmost province both of the Flemish Region, also called Flanders, and of Belgium. It borders on (clockwise from the North) North Brabant province of the Netherlands and the Belgian provinces of Limburg, Flemish Brabant and East Flanders. Its capital is Antwerp which comprises the Port of Antwerp. It has an area of 2,867 km2 (1,107 sq mi) and with 1.8 million inhabitants it is the country's most populous province. The province consists of 3 arrondissements: Antwerp, Mechelen and Turnhout. The eastern part of the province comprises the main part of the Campine region. During the early Middle Ages the region was part of the Frankish Empire, which was divided into several pagi. The territory of the present day province belonged to several pagi of which the region around Antwerp belonged to the Pagus Renesium. The Pagus Toxandria stretched from North Brabant into the Campine region. To the south there was the Pagus Bracbatinse and the Pagus Hasbaniensis. In 843 the Carolingian Empire of Charlemagne was divided among his sons and the river Scheldt became the border between West Francia and East Francia. In 974 Otto II established the Margraviate of Antwerp as a defence against the County of Flanders. The aftermath of the plundering of the village of Wommelgem in 1589. Eighty Years' War. In 1106, Henry V granted the Margraviate to Godfrey I of Leuven. His descendants would from 1235 onwards become the Dukes of Brabant and the region itself was the northern part of the Duchy of Brabant. In 1430 the Duchy became part of the Duchy of Burgundy until 1477 when it fell to the House of Habsburg. In 1713, at the end of the Spanish Succession War the region became part of the Austrian Netherlands until 1794, with in 1790 the short lived United States of Belgium. On 1 October 1795 the former Austrian Netherlands were annexed by France under the French Directory. The modern province was created as the Department of the two Netes during the First French Empire (when the Southern Netherlands were part of France). After the defeat of Napoleon, the territory became part of the United Kingdom of the Netherlands as the province of Central Brabant, distinguishing it from North Brabant and South Brabant. In 1830, after Belgium's independence the province was renamed Antwerp (after its major city and capital). As in all Flemish provinces, the official and standard language of the Antwerp province is Dutch. Common with Flemish Brabant, North Brabant and Brussels, the local dialect is a Brabantian variety. According to the International Social Survey Programme 2008: Religion III by the Association of Religion Data Archives, 73.3% of Antwerp's population identify themselves as Catholics, 24.1% as non-religious, 2.6% identify themselves in other religions. The province of Antwerp has a provincial council, elected every six years, and an executive deputation headed by a governor. The current governor is Cathy Berx, appointed in 2008 by the Flemish Government. For the 2013-2018 legislative term, the deputation consists of a coalition of N-VA, CD&V and sp.a, that each have 2 deputies. The three parties have a majority of 50 seats out of 72. Highest point: Beerzelberg (55 m) located in the municipality Putte. The province has a network of roads, railroads, canals and rivers which provide a modern infrastructure. Historically, the traffic infrastructure was an important element of connecting the Port of Antwerp with the Ruhr Area in North Rhine-Westphalia, Germany. Both the Iron Rhine railroad and the E313 (King Baudouin highway) and E34 highway connect Antwerp with the Ruhr Area. The river Schelde, an important waterway, connects the Port of Antwerp with the North Sea. The Albert Canal connects the Scheldt in Antwerp with the Meuse and Liège. Other canals are the Canal Dessel – Kwaadmechelen, Schoten – Turnhout – Dessel, and Herentals – Bocholt which flows into the Nete canal. Of the International E-road network, the E313, E19, and E34 run through parts of the province. The Kennedy Tunnel and the Liefkenshoek Tunnel connect the highway network of the province with East Flanders and Ghent. In addition a new Oosterweelconnection is under consideration. The railroads connect the major cities of the province, such as Antwerp, Mechelen, Herentals, Turnhout and Mol. The Iron Rhine connects Antwerp with Mönchengladbach in Germany. The new High Speed Train connects Antwerpen-Centraal railway station with Brussels (HSL 4) and Amsterdam (HSL-Zuid) at high speed. Antwerp International Airport, located in Deurne is a regional airport. City of Antwerp. Main tourist attraction. The province harbors several historical cities, such as Antwerp, Mechelen, Turnhout, Herentals and Lier. The Campine region is becoming a popular destination for tourists searching for a quiet and relaxed weekend. Old farms were transformed into bed and breakfast-hotels, the restaurant and café business is very active and an ingenious network for bicycle tours has come to life the past few years. Here and there still up to several dozens acres of large heathland - and forests, such as the Kalmthoutse Heide (E: Kalmthout heathland) in Kalmthout, the moors around Turnhout, the Liereman (Oud-Turnhout) and the Prinsenpark in Retie. In a number of villages one can still see the typical Campine langgevelboerderijen (E: long facade farms). The province is home to several educational institutions and the University of Antwerp. Several research institutions are located in the province, such as the SCK•CEN, the European Institute for Reference Materials and Measurements (IRMM) and the Flemish Institute for Technological Research (VITO). International schools in Antwerp include Antwerp International School and Lycée Français International d'Anvers. The Port of Antwerp is the economic heart of the province. Until the agricultural crisis of 1880, the eastern part of the province was a largely agricultural region. The industrial development of the eastern part of the province, part of the Campine region, started at the end of the 19th century when industry established itself in the region. The availability of cheap labor, new roads, canals, tramways and railroads such as the Iron Rhine, stimulated the settlement of new industry. Brick making industry alongside the canals, paper and printing business in Turnhout. Non-ferrous metallurgy in Balen-Nete, dynamite factories in Arendonk and Balen. Tobacco and cigar factories in Arendonk and the first shoe factory in Herentals. During the 1920s, the industrial expansion of the region continued with the radium and copper factories in Olen, the glass factory in Mol-Gompel and the diamond industry in Grobbendonk and Nijlen. In the 20th century the first nuclear installation in Belgium was established at the SCK•CEN in Mol in 1962. The European Institute for Reference Materials and Measurements (IRMM), one of the EU Joint Research Centres, was founded in Geel in 1957 as a result of the Treaty of Rome. Innotek is a technology centre located in Geel and is part of the European Business and Innovation Centre Network (EBN). Industry in the Campine region of the province is mainly located alongside the E313, the E34 and the Albert Canal. The unemployment rate stood at 5.9% in 2017 and was lower than the national average. After World War II the Port of Antwerp was expanded and on its premises several chemical factories and oil refineries were established, such as Bayer, BASF, Monsanto Company. The chemical and petrochemical industry is widely represented in the port region and comprises the world's second largest cluster of petrochemical industry, next to Houston (United States). In 1967 Amoco Chemical Belgium N.V., now BP, was founded in Geel. Pharmaceutical industry was founded in Beerse in the 1960s, with Janssen Pharmaceutica and more recently with Genzyme in Geel. Soudal (silicon) in Turnhout and Ravago (plastics) in Arendonk became leading companies in their markets. The diamond industry and trade is traditionally located in Antwerp. At the end of the 19th century Hendrik Cassiers founded a diamond cutting company outside Antwerp, in Grobbendonk. Hendrik Cassiers and Frans Dela Montagne laid the foundations of the diamond industry in the Campine region. The industry would settle in Nijlen, Herenthout, Bevel, Kessel, Vorselaar and Berlaar. The region around Turnhout became famous for its printing business, with companies such as Brepols, which roots date back to 1796 when Pieter Corbeels established his printing business in Turnhout. In 1833, Van Genechten N.V., Splichal N.V. in 1856, Mesmaekers Freres in 1859, Meses-Goris in 1872, L. Biermans in 1875, Poupaert in 1881, La Belgica N.V. in 1907, H. Proost & Co in 1913, J. Van Mierlo-Proost in 1918, Lityca in 1932 and Veloutex in 1951. More recently in 1970, Cartamundi was established, a world leader in playing cards. While Wallonia was famous for its steel industry, the Campine region became renowned for its non ferrous metallurgies. The Campine region was scarcely populated in the 19th century and with the availability of canals, the Iron Rhine and cheap labor, several metallurgies were established in the region. In 1888-1889 the metallurgy La Vieille Montagne was founded in Balen-Nete, close the Iron Rhine and the canal to Beverlo. The company had its roots in the exploitation of the zinc mines of Moresnet. The Union Minière du Haut Katanga founded the Société Générale Métallurgique de Hoboken in Olen, which was established along the Iron Rhine and the Albert Canal. The factory produced radium, cobalt and copper from the mines of the Union Minière in Katanga, Belgian Congo and Rhodesia. Along the canal Turnhout-Schoten the Métallurgique de la Campine was established in 1910 for the production of lead and antimony. In 1919 La Metallo-Chimique was established which specialized in the production of copper. In 1872 the Sablières et Carrières Réunies (SCR), now Sibelco, was founded to extract the silica sand layers in Mol for industrial applications (glass). In 1920 the glass bottle manufacture Beles Réunios was set up in Mol-Donk. In 1921 a group of Belgian banks, the Mutuelle Mobilière & Immobilière, the Société Générale de Belgique, the Banque de Bruxelles and the Financière de Transport together with the American group Libbey-Owens founded the Cie Internationale pour la fabrication mécanique de Verre in Mol Gompel. In 1931, due to the economic crisis, the company merged into Glaces et Verres (Glaver). In 1961 Glaver would merge with Univerbel into Glaverbel. As the Campine region was sparsely populated several dynamite factories were established in the region. In 1875, the Societe Anonyme d'Arendonk was established which premises would later become part of Ravago. In 1881 La Forcite N.V. was established near Balen, which was later acquired in 1920 by the Poudreries Réunies de Belgique (PRB). In 1887 a factory was founded near Herentals, which was closed due to the vicinity to the city. The factories produced explosives for the mines and quarries. The factories in the province are now closed down. Historically, wool processing industry was based on the wool from the sheep which were kept on the Campine heath. The centre of the textile industry in the province could be found in Turnhout. Wool processing companies such as Wolspinnerij Van Iersel, Spinnerij en Weverij Van Hoof and De Wollendekensfabriek Van Doren were located in Mol. At the end of the 19th century Arendonk became the centre of the tobacco industry. Additional factories were founded in Turnhout, Mol, Geel and Herentals. After World War II, the ALTO cigar factory was founded by Frans Van den Bergh who would also play an important role at Janssen Pharmaceutica. ^ a b "Analysis | International Social Survey Programme 2008: Religion III | Data Archive | The Association of Religion Data Archives". www.thearda.com. Retrieved 2017-04-17. Geel is a city located in the Belgian province of Antwerp, which acquired city status in the 1980s. It comprises Central-Geel which is constituted of 4 old parishes a/o towns: Sint-Amand, Sint-Dimpna, Holven and Elsum. Further on around the center are the parish-towns of Ten Aard (N), Bel (E), Winkelomheide (SE), Stelen, Oosterlo and Zammel (S), Punt (SW) and Larum (W). On December 31, 2016, Geel had a total population of 39,535. The total area is 109.85 km2 (42 sq mi) which gives a population density of 320 inhabitants per km². Geel’s patron saint, the Irish Saint Dymphna, inspired the town’s pioneering de-institutionalized method of care for the mentally ill.
Herentals is a city in the province of Antwerp. The municipality comprises the city of Herentals proper and the towns of Morkhoven and Noorderwijk. On January 1, 2006 Herentals had a total population of 26,071. The total area is 48.56 km2 (18.75 sq mi) which gives a population density of 537 inhabitants per km². Saint Waltrude is the patron saint of the city. Turnhout is a Belgian municipality located in the Flemish province of Antwerp. The municipality comprises only the city of Turnhout proper. On January 1, 2015, Turnhout had a total population of 42,637. The total area is 56.06 km² which gives a population density of 835.5 inhabitants per km². The agglomeration, however, is much larger, accounting up to 81,473 inhabitants. Turnhout is known for its playing card industry, as it houses the head office of the world's largest manufacturer of playing cards, Cartamundi. Turnhout is also the capital of the administrative district with the same name. The Turnhout city council often promotes the city as "the capital of the Kempen area". This designation is entirely unofficial, since the Kempen area is far larger than the Turnhout district and does not form an administrative unit. Deux-Nèthes was a department of the First French Empire in present-day Belgium and the Netherlands. It was named after two branches of the river Nete. The southern part of its territory corresponds more or less with the present-day Belgian province of Antwerp. The Nete is a river in northern Belgium, right tributary of the Rupel. It flows through the Belgian province of Antwerp. It is formed in Lier, at the confluence of the rivers Grote Nete and Kleine Nete. It flows through Duffel and joins the river Dijle in Rumst to form the river Rupel. It drains nearly 60% of Antwerp province. The Campine (French) or De Kempen (Dutch) is a natural region situated chiefly in north-eastern Belgium and parts of the south-eastern Netherlands which once consisted mainly of extensive moors, tracts of sandy heath, and wetlands. It encompasses a large northern and eastern portion of Antwerp province and adjacent parts of Limburg in Belgium, as well as portions of the Dutch province of North Brabant and Dutch Limburg around Weert. The Vlaams Economisch Verbond or VEV is a Flemish employers' organization and lobbying group. It was founded in 1908, by among others Lieven Gevaert as the Vlaamsch Handelsverbond, to create a Flemish counterpart of the Federation of Belgian Enterprises, and it became the VEV in 1926. The Liberaal Vlaams Verbond was founded in 1913. From its origin it wanted to promote the Flemish cause and drew attention to social matters, within the Belgian Liberal Party. Together with the Willemsfonds and the Liberaal Vlaams Studentenverbond, it is one of the Flemish liberal organizations. Herentals is a railway station in Herentals, Antwerp, Belgium. The station opened in 1855 and is located on Line 15 and Line 29. Turnhout is a railway station in Turnhout, Antwerp, Belgium. The station opened in 1855 and is located on Line 29. Donk is a township in the municipality of Mol in the province of Antwerp in Belgium. Donk resides at the southern side of the Bocholt–Herentals Canal and is an industrial area, especially in past.